Simple is a brand that has been a part of my daily routine for as long as I can ever remember, and yet, despite the odd mention, I have yet to blog about any of the products! *smack on the wrists! * So the Simple City Life Summer Event gave me the opportunity to learn more about the brand, and also how the products can be used to protect our skin from the harm that can be caused just from city living. Simple have worked with leading dermatologists, including Susan Mayou who told us how factors such as pollution, weather and stress that comes with living in the fast paced environment of the city can be harmful for our skin. Before the talk from Susan, we were treated to a super healthy breakfast – chosen for us by nutritionist Fiona Hunter. They included a scrumptious detox smoothie and salmon and avocado bagels, but my favourite was the Greek Yogurt and Berry ‘Summer Shot’ – Fiona chose the ingredients as berries are big on antioxidants and vitamin C, which encourages radiant skin and healthy hair. Oh, and it tasted pretty darn good too! Ahem, back to the actual event! 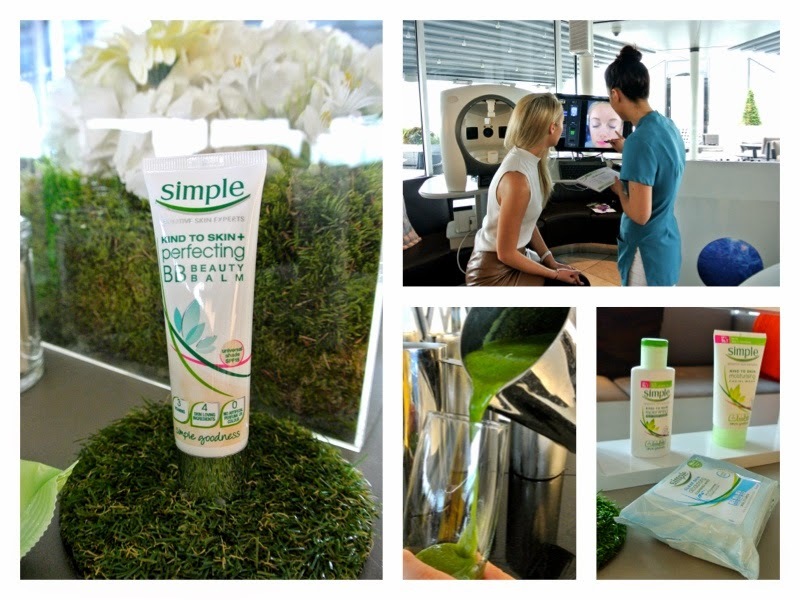 Simple’s City Skin initiative is aimed at educating women about products that can easily be integrated into a daily routine, but offer effective changes that improve skin texture, tone and health. I mentioned way way WAY back in one of my first ever posts (Urban Decay: City Living Vs Your Skin here) that my skin had suffered since moving to the city, and dermatologist Susan confirmed that pollution in cities impacts skin, causing the formation of free radicals or reactive oxygen species. Pollution can therefore cause barrier damage and inflammation, but long term it can also cause fine lines, wrinkles, and dyspigmentation – not something us #bbloggers want! – Use a teaspoon worth of SPF moisturiser on your face – most of us only use half the recommended quantity of SPF lotion on our faces and bodies, meaning that we get only half the protection. – Use SPF in your daily routine every. single. day – Simple’s experts recommend the Kind to Skin Protecting Moisturiser in SPF 15 (only £4.99!). – Use products that cleanse skin twice a day, this will remove poryphins caused by dirt and polluted air. Simple’s Kind to Skin Purifying Cleansing Lotion can be used day and night, and thoroughly removes dirt from pores. – Rich hydrating products will combat the signs of stress-induced skin, such as the Simple Hydrating Light Moisturiser. Also at the event, there was a psychologist and fitness expert – who I chatted to about ways to reduce stress and keep fit – as a holistic approach to skincare involves getting the right nutrition, exercise, and relaxation routines – not just the products. The girls at Simple kindly gave me a goody bag with some products specifically selected for my skin type, as a result of the scan, so I look forward to reviewing them all very soon on the blog. Simple products are widely available, you can see most of the products on the Boots website here.